We take roughly 20,000 breaths a day, mostly without thinking, but exactly how our breathing is controlled is a puzzle that has perplexed thinkers from Aristotle to Galen to modern physiologists. This universal mammalian instinct is still so poorly understood that there currently are no pharmacological treatments for human breathing disorders, like sleep apnea or sudden infant death syndrome. 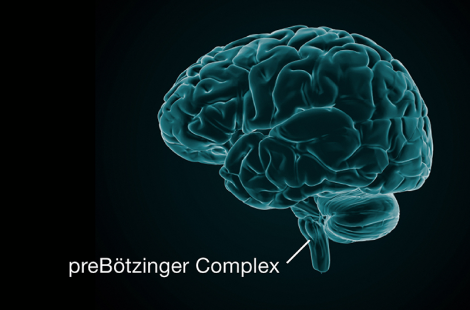 Just as our heartbeat is controlled by pacemaker cells in the heart, our breathing is regulated by a cluster of a few thousand cells in the brainstem known as the preBötzinger complex, or preBötC. Discovered in 1991, these cells are the center of breathing regulation. They send rhythmic signals to our spinal cord, which relays them to skeletal muscles, like the diaphragm, that expand our lungs. But the mechanisms by which this region of the brain regulates breathing are still a mystery, one that UC San Francisco physiologist Kevin Yackle, MD, PhD, is tackling with the latest tools of molecular biology. Yackle, a Sandler Faculty Fellow, is trying to zero in on the specific cells of the preBötC that generate the breathing rhythm – though not all researchers in the field agree if such a breathing pacemaker exists. Unlike the well-understood heart pacemaker, the breathing pacemaker has remained an elusive target. It's not an easy subject to study. For one thing, breathing is a more complex behavior than the heartbeat: it can be voluntary or involuntary; it must be coordinated with speech, singing and swallowing; and it has distinct variations, like sighs, yawns and gasps, which can be tied to a range of emotions. The few thousand cells of the preBötC – discovered by Jack Feldman, PhD, a neurobiologist at UCLA – may be involved in all these aspects of breathing and it's unclear how the division of labor occurs. Although researchers have been able to measure bursts of electrical activity from a small number of neurons in the preBötC at the intake of each breath – which suggests these may be the ones setting the rhythm – these neurons are intermingled with other neurons. There's no easy way to isolate these neurons from the mosaic, nor is it even clear that the same neurons fire every time. Yackle believes he may be able to tease out the breathing pacemaker neurons by looking at gene expression. Sifting through a database called Eurexpress, he's screened expression patterns for more than 19,000 genes in the preBötC of mice and identified dozens of neural types marked by distinct molecular signatures. After identifying a group of neurons by some commonality in gene expression, Yackle then studies their function by turning them off in mice. He hasn't found the pacemaker yet, but in the course of his searching, he's stumbled upon something remarkable: distinct groups of neurons that control surprising aspects of the breath. The first group of neurons he found were the ones that control sighing. A sigh is essentially a double breath that allows the lungs to fully inflate. This is physiologically important because the many minute alveoli of the lungs begin to collapse in the course of normal breathing and must be reinflated through sighing. In fact, all mammals sigh, and the smaller the animal, the more frequent the sighing because tinier alveoli are more prone to collapse. We hardly notice it, but humans spontaneously sigh about every five minutes. Mice sigh every two minutes. Through his genetic screening, Yackle found some cells near the preBötC that were producing an interesting molecule. Earlier work by Feldman's lab at UCLA had found that a similar molecule called bombesin could induce sighing when injected into the brain stem. Realizing they held different pieces of the same puzzle, the two labs worked together to identify the preBötC neurons responsible for sighing. When these neurons are disabled, mice do not sigh. Since then, Yackle has also identified neurons in the preBötC that act as a relay station between breathing and a brain area involved in attention and arousal. Sniffing in mice normally triggers alertness, but with these neurons disabled, the feedback system is broken and mice are uncharacteristically calm; instead of anxiously exploring a new environment, they settle down to groom. The researchers now refer to these 175 neurons as the pranayama neurons, after the ancient yogic breathing techniques. If these neurons can be identified in the human brain, they may explain how slow, deep breaths can help relieve anxiety and depression. Some neurons produce sighing and others connect breathing with attention. Recently, Yackle has found a small group of neurons that seem to control the length of exhalation. "By classifying subpopulations, we've found that different aspects of breathing can be separated at the cellular and molecular level," he said. For Yackle, these findings are a good sign that control of the breathing rhythm also lies in a subpopulation of cells in the preBötC waiting to be molecularly defined. Because breathing is such an essential biological function, the physiology is likely conserved across mammalian species, said Yackle. His studies in mice might eventually help us understand and treat human breathing disorders. Premature babies who have irregular breathing are sometimes treated with caffeine, but scientists don't really understand how that works, said Yackle. "We currently don't have any ways of controlling breathing rhythm pharmacologically," he said. Not everyone believes there is a breathing pacemaker to be found. 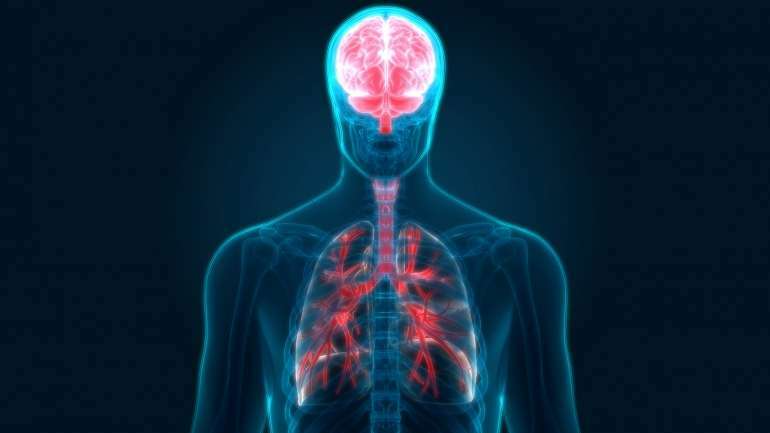 Many in the field of respiratory neurobiology now believe the breathing rhythm is an emergent phenomenon – that it arises from the coordinated efforts of different cells in the preBötC. This includes Feldman at UCLA, who 25 years ago discovered the preBötC and is a prominent figure in the field. Feldman says understanding the breathing rhythm is a "goal that defies any easy discovery." His team had years ago considered the theory that a specific subset of neurons was responsible for breathing rhythm and discarded it, along with other obvious hypotheses. Despite the skeptics, Yackle is optimistic about his search. He believes those earlier studies could not rule out the possibility of specific pacemaker neurons because they didn't molecularly define the cells. In order to reproducibly find a cell in the preBötC and test its role in breathing, you have to be able to genetically access the cell, said Yackle. "The fact that we can find cells that are molecularly distinct and it appears so far that they are also functionally distinct, it seems to me that the premise that all of these cells can function in a redundant way doesn't seem to be true," said Yackle. "We know that they're there, we just don't know yet how to uniquely define them." He is hoping to define them through his systematic genetics approach – reviving a discarded theory with new molecular tools. It's possible now, for example, to measure the electrophysiological activity of a single neuron, extract that single neuron, and sequence its RNA, said Yackle. Despite their differing views on the breathing pacemaker, Feldman and Yackle collaborate often and are mutual fans. When Feldman saw that Yackle had systematically combed through gene expression databases to map the preBötC, he thought, "Why didn't I think about this?" "He's done incredible things," said Feldman. "Someone with much less imagination and creativity would have just taken the data and published that data. But for Kevin, it was a means to new experiments."